Ask 10 jewelers about one diamond and you might hear 10 different stories. Ask 10 independent appraisers and the clinical analysis may agree, but terminology and methodology can vary. But ask 10 PriceScope prosumers and you often see unanimous agreement. Curious, isn’t it? What could possibly cause a diverse group of thousands of consumer enthusiasts and pros alike, to use the same terms and uphold similar values when evaluating diamonds? The answer is simple: Knowledge, comprehension and consistent analysis. So, how do we know? How do we know that “Cut is King?” One word: Science. In fact, carat weight and cut are the only non-subjective, demonstrable and repeatable diamond components. Beginning with Cardinal Mazarin, Henry Morse and Marcel Tolkowsky, we find treatises written on the science of light return, reflection and refraction. In recent years Sergey Sivovolenko, Dr. Jose Sasian and AGS Laboratories have validated many conclusions of those early masters (Bravo Tolkowsky!). While the calculus is fascinating, it is far beyond the consideration (and attention span) of most shopping consumers. We are lucky, however, to have a simplification. We have tools which take much of the calculus and show us, in simple color, how diamonds return light to our eyes. There are people who claim that you only need a grading report, an idea of proportions and the ability to see a diamond in real-life to get the evaluation you need. But a growing segment of the industry, and many consumers armed with knowledge found on PriceScope, rely on images of diamonds using tools to arrive at a superior assessment of diamond performance than a non-descriptive grade on a lab report. Indeed, there are vendors who have developed lines of top-performing diamonds which use Ideal-Scope and ASET as proof of the performance pedigree. At B2C Jewels, we use real images, hearts & arrows views, Ideal-Scope and ASET images for every diamond in our Perfection Cut for Performance brand. This is done by other cut-focused sellers like High Performance Diamonds, WhiteFlash, Good Old Gold and others. As with any tools, these images which evaluate light performance – the Ideal-Scope and the ASET – have both benefits and limitations. The intent of this article is to create a clear comparison of the two. Note that diamonds are sometimes photographed in structured light environments (IS and ASET). 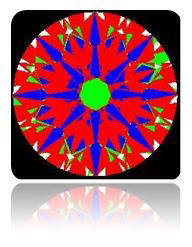 In other cases a 3D scan of the diamond is imported into computer software which generates a computer-rendering of the IS or ASET image. In this article we use both approaches. 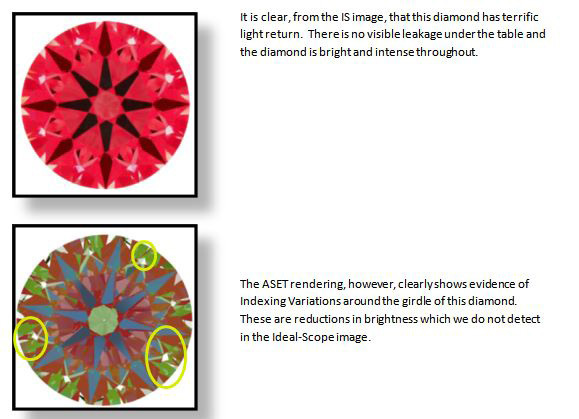 As noted, the Angular Spectrum Evaluation Tool ® (ASET) and the Ideal-Scope are tools of preference when assessing light return in a diamond. They are also extremely accessible to vendors and consumers. Using the ASET or Ideal-Scope eliminates much of the proportions-calculus for determining light performance from a diamond. The following images show you what you might expect to see. “What about those black places?” Good question… In the photos above the areas which appear Black in Ideal-Scope (black/blue in the ASET) are a reflection of the dark camera lens (or viewer’s head in actual viewing). Such areas are called ‘obstruction’ and are important to contrast and scintillation: In well-cut diamonds obstructed areas are symmetrical and orderly. Why? Because in real viewing those areas of brightness and obstruction constantly swap on and off when the diamond moves, creating what we see as scintillation. We call the orderly (or not) areas of obstruction a contrast-pattern. To a new shopper especially, occurs the question – what do they tell you? Why are they important? In simplest form, the images tell you where light ‘passes though’ the diamond (undesirable leakage) vs. where light is returned to the viewer’s eye (desirable brightness). In these views the Ideal-Scope and ASET images are backlit, meaning a light is placed underneath the diamond as it is being viewed to reveal and exaggerate any leakage, which will appear as white. There are also non-backlit versions of ASET where leakage is dark rather than white – more on that later. Where there is light return of any intensity in Ideal-Scope you will see red or pink. The diamond above is not a top-performer, because it has been cheated (cutting term) along the upper girdle facets, causing a reduction in brightness at the edges. What is an important takeaway, and the purpose of this article, is to demonstrate that we SEE this reduction easily in the ASET. However we don’t see it in Ideal-Scope. As you can see the light return from both diamonds is above average (not top-performing, but above average). There is saturation of light return from both. It is, of course, impossible to tell – by the IS or ASET images – what the color or clarity grade of the diamond(s) will be. The inclusions visible in the D SI2 above in the ASET or IS images are also visible in the real image, so the light performance images do not reveal anything that cannot be seen in a simple photograph. You also cannot tell the difference in the color of the diamond based upon any of the photographs (even the real image). This is due in large part to the variations in filters, lenses, lighting conditions, and even your computer monitor. 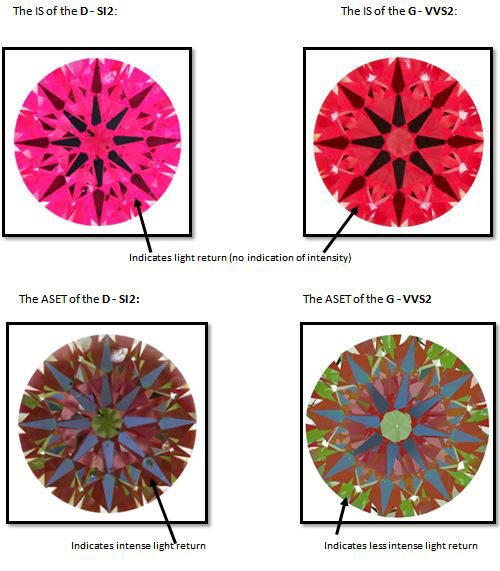 There is simply no way to perfectly standardize all of the variables in order to determine the color of the diamond through light performance images. Obviously, both tools give a good measure of light performance – but make no mistake – that is their sole purpose! Neither an ASET nor an IS image will tell you anything regarding the color or clarity of a particular diamond. Do not make the mistake of thinking an ASET or IS image that is darker than another indicates something about a diamonds color, or an ASET image that shows more green indicates inclusions or flaws in the diamond that are part of the color or clarity. To be clear, often times inclusions can be detected in the IS or ASET images, but they can also be seen in the real images. Most importantly, IS and ASET are both indicators of brightness, leakage and contrast ONLY. The actual fire (dispersion) and scintillation of a diamond will depend upon precision of cut and light environment. So while they are great indicators of potential, they are not ultimate in terms of sparkle and beauty. What you CAN see is a difference in ASET information versus Ideal-Scope information. The Ideal-Scope treats all light return as essentially the same – it will be a shade of red without regard to the angle of light origin. The ASET, on the other hand, allows the discriminating viewer to determine from what angle the light is being returned to the eye of the viewer. Blue – Dark contrast areas that indicate obscured light (from the head of the viewer, the camera lenses, etc.) in the 75-90 degree range. In the best cut diamonds this will be approximately 18% of the total light return. Red – The most direct and intense light return. This indicates light reflecting from the 45-75 degree range. Green – Reflected light, not as intense as (red) direct light and of lower quality, representing the light return from the horizon to 45 degrees. 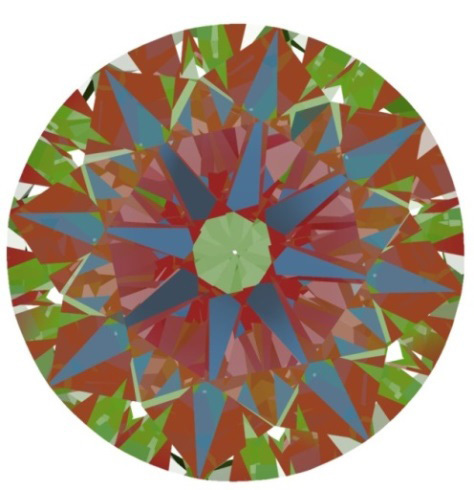 In the case of the diamond above it is clear, in the ASET, that there are large areas of less-intense (Green) light around the edges of the diamond close to the girdle. The Ideal-Scope will not indicate these differences. It is plain to see in the examples above there are areas of less intense light return that the viewer cannot discern without an ASET image. …and the image bears that out. But the Indexing Variations around 2 o’clock show something that needed to happen in the cutting process which reduced the veracity of the cut and – while perhaps indistinguishable to the naked eye in a ‘real-life’ situation, it will return less intense light from that area. Additionally, this image brings up a very interesting aspect of ASET imagery. The background of the image is black – setting up the impression that the image is not backlit. Instead, because you see the white leakage at the expected facet junctions around the perimeter you can tell that this is a backlit scan. At B2CJewels we choose the backlit ASET with all of branded “Perfection Cut for Performance” diamonds. There are several other reputable companies that have a line of top performing diamonds. Almost without exception these companies will present both an Ideal-Scope and an ASET image of each diamond, not *just* an Ideal-Scope. We present the ASET because it is critical in teasing out true *top* light performance in a Modern Round Brilliant. Indeed, the companies that choose to field a “branded” line of diamonds, with ASETs of each, have already done a great deal of leg-work for the consumer. The angles, proportions, eye-cleanliness and light performance have all been deemed worthy of the top possible performance, and they provide the grading and light performance images to prove it. Real images, Hearts and Arrows views, and magnified photos are becoming pre-requisites for online diamond sales today and they can tell you a great deal about a diamond. It is important, however, to note that the most critical aspect – the optical performance of the diamond – is found only in the Ideal-Scope and (in superior terms) the ASET view. 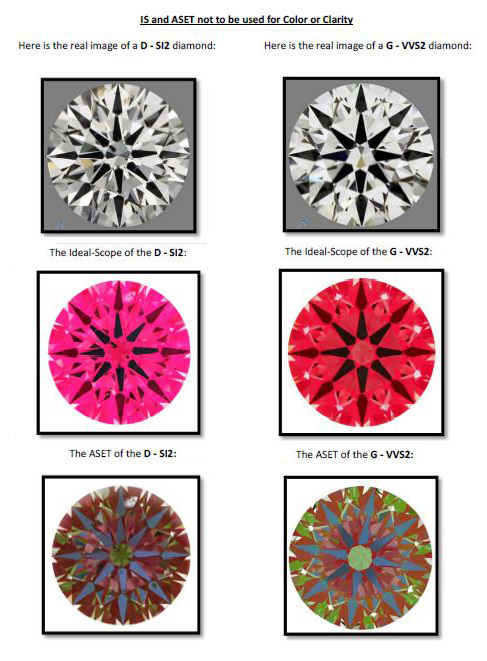 Companies offering complete disclosure about diamond performance offer these images. The choosy consumer will realize that the most accurate optical performance can best be seen by using the ASET viewer. It is critical, then, when making a determination of light return in a Modern Round Brilliant that the ASET be taken, viewed, and analyzed to verify the optical pedigree.